"Mutter, Mutter! I've murdered six million Jews!" You hear him shout it proudly as he rushes into the kitchen, demanding that you follow him out so he can show you the extermination camp furnace he's been hard at work building in the garden shed all morning. But when you look, he's already fired it up and the chimney is belching thick, oily smoke and the stench of burning human flesh all over the clean laundry you hung out to dry! But how can you be angry with dear little Addy? That cheeky, cherubic face and those adorable chubby cheeks! The soft and glossy chestnut hair, the big brown eyes...oh! what's this? 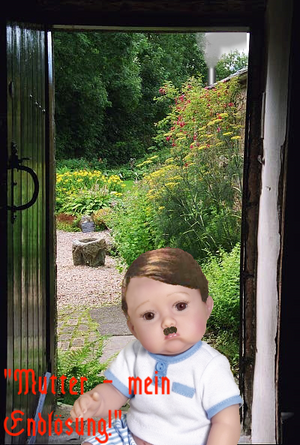 Why, just take a look at that cute little toothbrush moustache - he's growing up fast, so make sure you give him all the cuddles you possibly can! Instead of chastising him, you scoop him up in your arms and give him a big hug and plenty of kisses. "I love you, Mutter" he whispers in your ear. After all, what do six million Jews matter - the Allied Powers didn't care about them, so why should you when he's obviously been having such fun? And now, this charming and amazingly lifelike porcelain doll can be yours, only from Das Reichsmint Ltd. of Bavaria. Designed by world-renowned doll artist Phil Istine and hand-crafted by machines from the very finest quality vinyl, production of this desirable collectors' item is limited to just 10 billion and demand is likely to be high so post your order schnell. The "Mutter - mein Endlösung!" collectible doll is not available in any shops. "Mutter - mein Endlösung!" is priced at just £395, payable in five easy-to-manage installments of £79 (postage and packing not included). Fill out the form below and mail to us - you don't even need to affix a stamp!